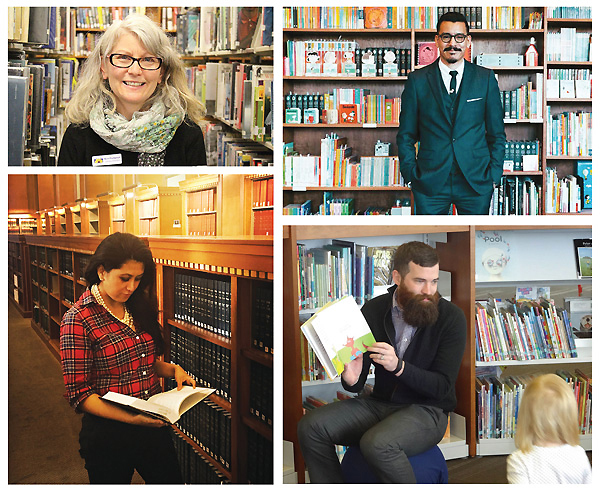 When it comes to what makes a good librarian, the first requirement is experience—whether in the library, working with records, or talking to patrons and students. LJ’s Paralibrarian of the Year Award is one of many testaments to the work done by those who learned libraries through hands-on labor. But sometimes there is no substitute for earning a Master of Library and Information Science (MLIS) degree—either to meet the benchmarks necessary to further a career already in progress, or to shift from an (often already successful) path in another profession. Earning an MLIS in midcareer brings particular concerns: keeping up with a demanding curriculum on top of job and family responsibilities often needing to stay in place rather than relocating to the program that best fits; taking on tuition costs on top of existing student debt; and mastering new technology at an age when many are comfortably settled into their current skill sets. But as the library field offers a plethora of opportunities for those earning their master’s in midcareer—or midlife, or both—the consensus is that the degree opens doors at any stage of the work cycle, and the additional work is well worth the effort. Many also cite the potential for incorporating knowledge from previous careers rather than starting from scratch. Jacqueline Freeman explains that as the former owner of an independent bookstore in Michigan, “I had worked with vendors and acquisitions, and so I had my eye out for those kinds of positions.” Freeman, a single mother of two teenagers, was looking for employment with some security and ended up working in print acquisitions at the University of Michigan (UM) Library. Her previous experience got her in the door, but “it was clear that if I wanted to advance within the academic library I would have to go back to school and I would need an MLS degree,” she says. Many midcareer MLIS candidates, however, are not looking to break into a new field but to acquire the bona fides they need to step into management roles. Particularly in small and rural libraries, the path to directorship can be fast-tracked with the acquisition of a degree—and sometimes the degree comes after the promotion. For instance, when David Leonard was tapped to lead the Boston Public Library (BPL) in 2016 he had served as BPL interim president for two years and, before that, as director of administration and technology for six but had not yet earned a library degree. He is currently enrolled in the library science PhD program at Simmons College, Boston, having completed his MLIS. Similarly, California State Librarian Greg Lucas, former senior editor at Capitol Weekly, was not yet a degreed librarian when he stepped into the role in 2014; he remedied by enrolling in the California’s San José State University (SJSU) School of Information (iSchool). After several years of college and four years in the U.S. Marine Corps, Patrick Lienemann followed his wife to the University of Iowa to get his MLIS. Lienemann first looked for a job and was hired by the Williamsburg Public Library (WPL), about 30 miles from Iowa City, as a part-time ­librarian. Soon after, the assistant director retired, and he moved up to fill her position. After a year the director retired as well, and in May 2014 Lienemann became the WPL director; he started his master’s degree that fall. While the choice between an online or on-site MLIS program is often a personal one, many people already in the workforce have often taken free online courses or MOOCs, such as those offered by Coursera, Udacity, or edX. They may have also enrolled in shorter online workshops through state libraries, associations, or private training providers as part of their professional development, so they know whether the format suits their learning style. Gary Shaffer, a 2006 LJ Mover & Shaker, received his PhD in managerial leadership in information professions from Simmons College while serving as CEO of the Tulsa City-County Library. “It was a standard PhD program—i.e., grueling—and all of us were working full-time as well,” he recalls. “We had comprehensive exams, we had dissertations, but we had a lot of practical coursework as well from very well-known leaders in the field and lots of [work] around fundraising. We had courses in human relations, leadership, management…that could be applied on the job immediately.” Shaffer is currently paying it forward very directly by helping design a program for others in the same boat: he’s the director of the University of Southern California’s Master of Management in Library and Information Science program, with a distance learning curriculum specifically designed to prepare library professionals for practical leadership and management. Many online degrees are cost-effective as well, which means that librarians can often cover their tuition without adding to existing student debt. Freeman chose the online program at Wayne State University in Detroit, even though UM had a tuition re­imbursement program that would have covered 75 percent of her degree. But Wayne State offered her a full scholarship, plus a computer, funding to attend the American Library Association (ALA) annual conference, and a mentor. Because she needed to keep working full-time, the online program offered enough flexibility that she didn’t need to cut back on her library schedule or take time off. Still, relocation to an area with interesting work and networking potential can be a draw, even with the added burden of living expenses. After Cesar Gallegos fell in love with special collections while getting a bachelor’s in English at the University of California, Irvine, and running a retail clothing store, he decided that not only did he want to pursue a library career, but he wanted to do it in New York. “There was this connective thread of loving history and archives and libraries. I felt that being in New York would put me in the middle of all that.” Gallegos packed one suitcase and moved across the country to attend the Palmer School of Library and Information Science at Long Island University. The issue of “grunt work” is another challenge for those earning a degree when they already have hands-on experience in the field—how do you reconcile the idea of internships when you’re already out in the workforce, or mandatory core courses when you’re a director? Lienemann feels that some of those redundancies helped lighten his schoolwork load a little—a welcome development in an extremely tight schedule. Returning students can feel the differences in age between themselves and classmates who come straight from completing undergraduate degrees, although less so in distance programs—both because age isn’t always apparent online and because such programs tend to attract more midcareer participants. Sometimes the gap manifests itself in outright ageism—the author of this article, whose career change was also motivated by a tight job market toward the end of the recession, earned her MLIS in middle age and was often met with surprise, by her fellow students, that she was so comfortable with technology. More often, however, what’s noticeable are generational differences in communication style or energy levels. Lienemann notes that even when he was finishing his undergraduate degree he was already seven to eight years older than most of his fellow students. “I just made my peace with [it]—they’ve got different life experiences, I’ve got different life experiences, let’s try to learn from each other.” He also noticed that classmates were more inclined to use him as a resource, asking him questions about how his library operates—an educational opportunity for him as well. LJ: How do you tailor a class to varying degrees of experience? MS: I offer multiple paths or “choose your own adventure”–style modules so those with more experience can explore a topic of interest to them. Everyone is invited to reflect on course concepts through their own POV. My classes can include people at various stages of their careers. Some are returning after years in another profession, including teachers, attorneys, and folks who have worked in media and entertainment, law enforcement, business, etc. Their experience informs their learning and their sharing/reflection is through the lens of that life experience. It makes conversations more diverse and illuminating for others. This also goes for those who have been in libraries for a number of years and have decided to get the degree. Do you find resistance from midcareer students to learning core concepts that they already have hands-on experience with? The first class many take is my core introduction to Information Communities, which gives everyone exposure to information behavior theory and user research of all types. We also take a close look at ethical issues and foundations of the field as part of meeting a community’s needs. That gets everyone on the same page. Someone who has worked in libraries for a few years might not have encountered this research even though they see the behaviors playing out with their own users. It adds context to our profession that might not be there through on-the-job experience. How do other students react to being in the same class as someone who has so much experience? Students seem to support each other no matter where they are in their careers and willingly learn from those who may be “in the trenches.” Those folks are usually eager to share stories about programs they work on or things they do as part of their jobs. I'm a middle aged, mid career lover of libraries and lapsed lawyer. I'm trying to find up-to-date employment information for entry level librarians in the NYC metro area. Can any of the readers provide some guidance? I came upon a post from 2012 responding to a Forbes article which called the MLS the worst master's degree, in which many librarians decried the training they received in the MLS programs and bemoaned the poor career prospects for librarians. I know my local libraries hire some librarians and I think I would be good at the work - my question is whether the employment outlook has improved since 2012 and what is the placement rate out of library school. I wouldn't want to attend library school and incur significant debt if there are few prospects for the school's graduates, or if many graduates are forced to take positions that are non-librarian in title, responsibility and salary (e.g., aide, clerk, page).